Earlier this year I saw Peter Brook’s Battlefield at the Young Vic; it was his adaptation of five books from the Sanskrit epic Mahabharata. 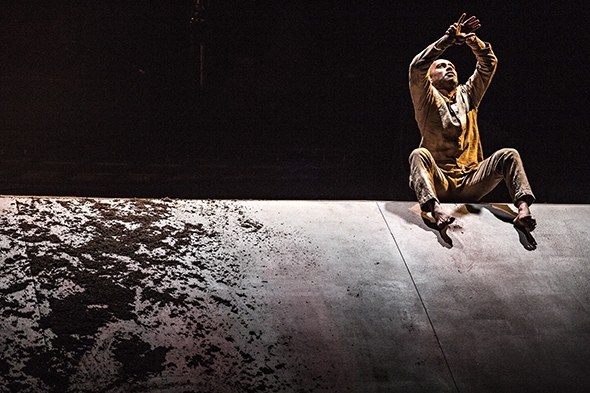 Akram Khan made his debut at the age of 13 in Brook’s original nine-hour production of the Mahabharata. What a coincidence then, that Khan should present in the same year as Battlefield another story from the same saga, one of love, betrayal and revenge in an original reworking by Karthika Naïr that has become Until the Lions. The title comes from an African proverb: ‘Until the lions have their own historians, the history of the hunt will always glorify the hunter.’ The lion in Naïr’s poem is Amba, the daughter of the King of Kashi who is abducted on her public swayamvara (betrothal) ceremony by Bheeshma, the son of the Kuru king. Vowing revenge on Bheeshma, Amba immolates herself and is reincarnated as the male warrior Shikhandi by whose hand Bheeshma meets his end on the battlefield. The dual role of Amba/Shikhandi is danced respectively by Ching-Ying Chien and Christine Joy Ritter; the role of Bheeshma is danced by Khan himself. Until the Lions has Kahn’s signature symbolism and spirituality dressed in white and covered in haze, with arresting stagecraft and musical accompaniment (by Sohini Alam, David Azurza, Yaron Engler and Vincenzo Lamagna). The dancing of Chien and Ritter is what we have come to expect in Kahn’s international casts of exceptional artists whereas Kahn’s own performance, even if his presence is strong, lacks the flow and attack he once had. It is something he acknowledges, but it begs the question of why he didn’t find a younger dancer on whom to create the role. The result is a performance that has all the appearance of significance yet lacks its bite. There is a feeling that Nair’s poetry has not gained in the dancing, but is simply the starting point of something else, something defined more in the production values than in the content. Brook’s space for Battlefield is spare, a vast stretched stage cloth with very few stage elements. This environment stands in stark contrast to the subject of the dialogue and enhances the production’s focus on the clarity of thought. Khan and his producer, Farook Chaudry, have taken a different path. The narrative involving three characters has been treated with a monumental production by conceiving it for the 360° Network of round artistic venues across the world. Created in the round, with Tim Yip’s vast slice of fissured tree trunk for a stage and with Michael Hulls’ lighting, the setting is to dance what the rock concert is to music. Michael Billington commented on Battlefield that ‘at a time when theatre is giddy with technology, you are struck by the way economical means are used to maximum effect.’ By contrast Hulls seems to be vying with the choreography for primacy. The work premiered at The Roundhouse (a founding member of the 360° Network) in January. I didn’t see it there but at the Brighton Festival, which is not only one of 16 co-producers but also a co-commissioner of the work. The outside of the Brighton Dome is, like The Roundhouse, circular, but its concert hall is not configured for theatre in the round. It is at best an elongated semi-circle cut off by the stage, so fitting Until the Lions into this space required some spectacular fudging. The first thing you notice is the massive lighting rig to carry Hulls’ circular lighting conception and the second thing is the stage underneath it, a circular platform on top of the Dome’s regular stage. So why did the Brighton Festival co-commission and co-produce a work that, as conceived, does not fit into its venue? Why co-commission it at all? How much of the Festival’s dance budget was taken up with this co-commission and what did it get from it? The questions are relevant because the dance programming of England’s prestigious festival in its 50th year is much thinner than the quality of English dance would suggest; the Festival has an opportunity if not a responsibility to present a challenging and varied dance program, rather than go for the prestigious names like Khan, or hook up with what happens to be touring with Dance Consortium (as it happened, NDT2). It’s ‘lazy’ programming and it has a deleterious effect on the country’s dance ecology. Arts Council England, which funds both Akram Khan Company and the Brighton Festival, has a motto, ‘Great Art For All’. The motto has two elements: ‘great art’ and ‘for all’. Even if Khan is a well-known brand, great art does not necessarily equate with well-known names. And ‘for all’ implies that access to the great art is within the financial reach of a broad audience. An expensive work by a prestigious name means ticket prices are going to be high rather than broadly affordable and I can’t help feeling that with 16 co-producers and a co-commission, Until the Lions is roaring its way to the bank while the Festival is left strapped to build a dance program that does justice to the high quality of work that exists in the country (not to mention locally) with the public funds at its disposal. Perhaps a good starting point would be to appoint a dance producer; there is currently no mention of one listed under the Artistic Staff of the festival. There’s a music producer, a theatre producer, a classic music producer, and a family and children’s producer. For a festival that prides itself on its mandate to take ‘a new look at the arts’ and to have ‘the opportunity to assess developments in the field of culture…’ that’s a stunning omission.